Did my taxes last night and realized I’ll be getting a good deal more back than I had expected. My wife and I had been talking about getting another small fuel sipping car to use for commuting/errands, and now we can make that a reality. I love my stage 2 outback XT, but my wife is a little less fond of its 19mpg on premium gas and droning exhaust on longer trips. Thankfully we worked it out and I’ll be keeping it as my fun car/winter vehicle/truck substitute (putting a trailer hitch on it too) - but I need to find a cheap to buy, cheap to run used daily for about $3500. My first thought is a 5 speed Yaris hatch. I pretty much want something as minimal and basic as possible, and a Yaris is... well... a car, and nothing more. On our honeymoon last year my wife and I rented a 5 speed Opel Corsa in Ireland and had a ton of fun wringing it out on narrow back roads. 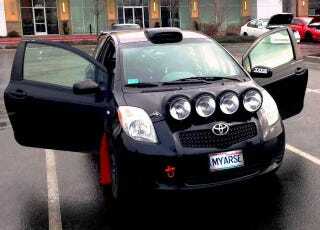 Seeing as we can’t get one of those here I figured a Yaris might fit the bill. However, I haven’t driven one and don’t know much about them so I figured I’d ask the Oppo hivemind for ideas. Open to other ideas as well, as long as they are small, manual and good on gas. Bonus points for being a hatchback. The longer I can go dailying a car that doesn’t cost us much the better chance I’ll have of her being on board with me getting more out there cars on the side. It was a little tough when over the last year my XT lunched a transmission and needed a full exhaust replacement and I had to fix it right away just to keep going to work, yet my wife’s beat up old Hyundai has never asked for more than $25 brake shoes and a few $20 tanks of 87 octane!